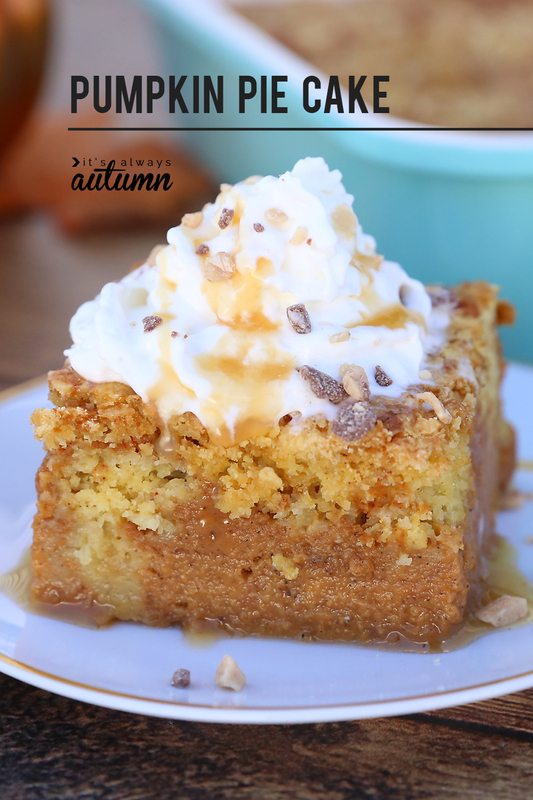 In today’s post: Pumpkin pie cake is your new favorite pumpkin dessert! 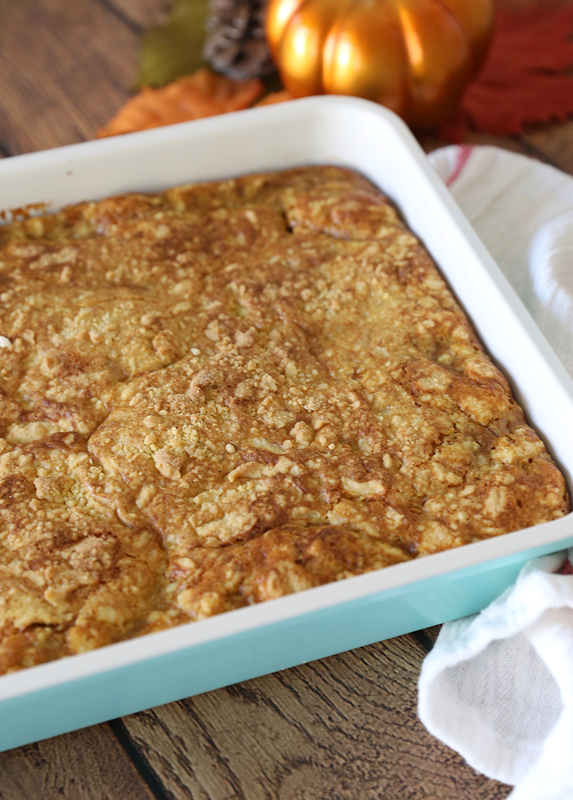 I first shared this recipe a few years ago, but it’s been so popular I decided it needed new photos and a printable recipe card to go along with it. This is pumpkin pie cake, an amazing update to pumpkin pie that ditches the traditional crust in favor of buttery cake-crumbles. It’s easy to make, feeds a crowd, and will be loved by everyone, even pumpkin pie haters like me. Plus it’ll make your house smell divine. The first time I tried this recipe I wasn’t sure what to expect. Pie? Cake? Something in between? Well, it’s definitely part pumpkin pie, creamy and spiced to perfection. But instead of a crust, the pie is mixed with crumbles made from a yellow cake mix and butter. Half of the crumbles get swirled into the pumpkin mixture, where they stay soft, while the other half goes on top, where they get just a little crunchy. The result is a moist, tasty, dessert that has all the creaminess and flavors of pumpkin pie without being quite so…well…boring. So what’s the difference between this and a pumpkin dump cake? 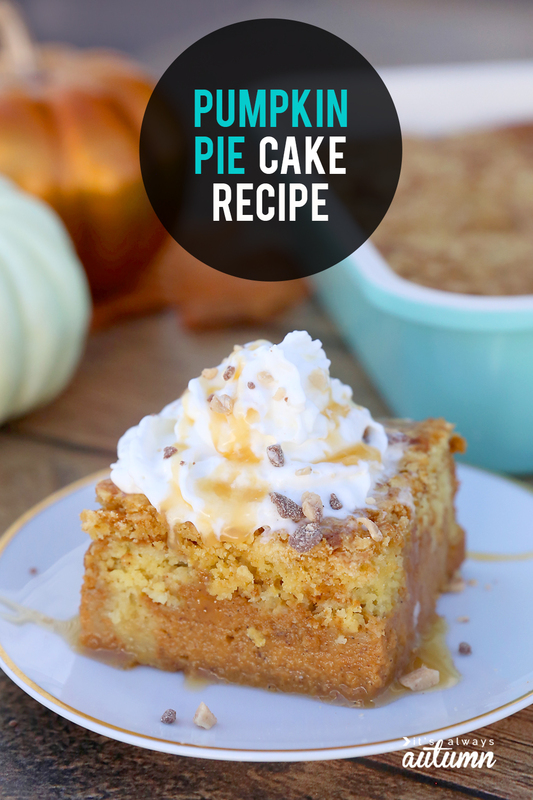 Well, the ingredients are similar but I think this pumpkin pie cake tastes better than a pumpkin dump cake because you’ve got buttery cake all through it instead of just on top. 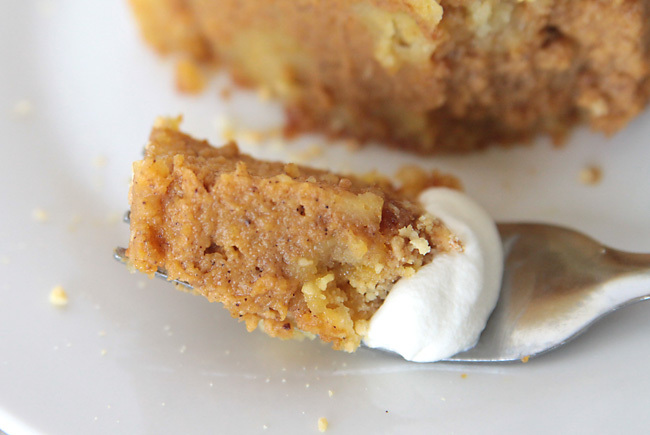 Here’s the recipe for dreamy pumpkin pie cake. It’s only going to take you about ten minutes to mix everything up and get it in the oven. Plan on an hour for baking, and a couple hours to chill before serving. 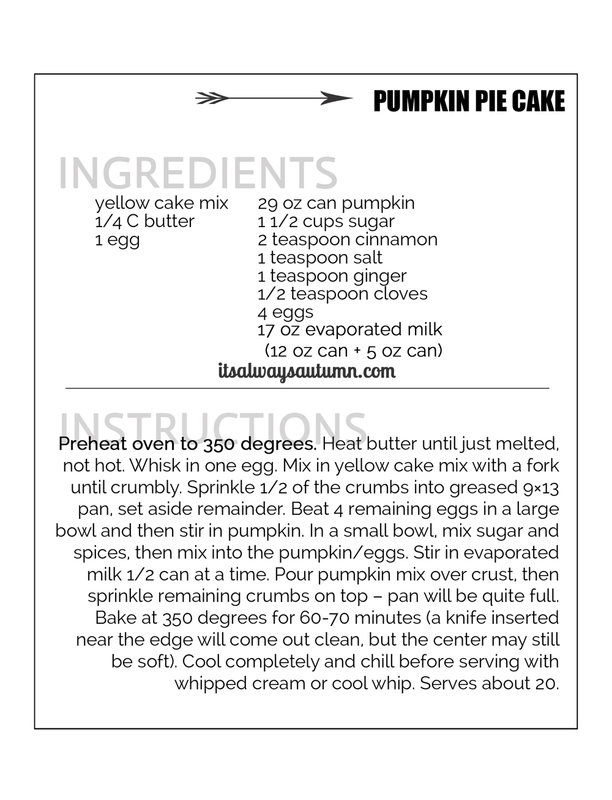 To download a printable recipe card, click here. 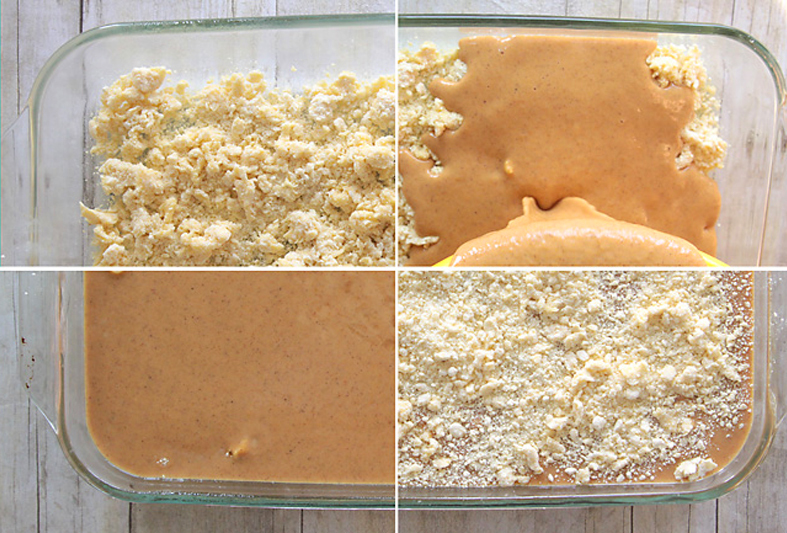 Basically, you make a pumpkin pie mix and a yellow cake mix. You’ll crumble half the cake mix on the bottom of a 9×13 pan, then pour in all the pie mix, then top with the rest of the crumbled cake mix. When it’s done baking, the pumpkin pie cake will be nice and golden brown on the top, and a knife inserted near the edge will come out clean. You’ll want to cool it completely before serving. I think it tastes best chilled, topped with whipped cream (required) and caramel sauce and toffee bits (optional). You can cut it into 20 small pieces or 15 larger pieces. Either way, everyone’s going to love it! I’ve made this recipe last year and it was awesome. Everyone loved it. I’m excited to try this! For some weird reason my kids don’t like pumpkin pie, so I never make or buy it because I’d end up eating it all myself. I think they’ll like this recipe. And a blogger note–I just LOVE your photo collage with the four rectangles–that’s brilliant! So sad I can’t make this in the Netherlands, we don’t have those ingredients…. Made this. Looked exactly like the picture, and was so good. I don’t understand what you did with the first egg and butter. Can you please elaborate? 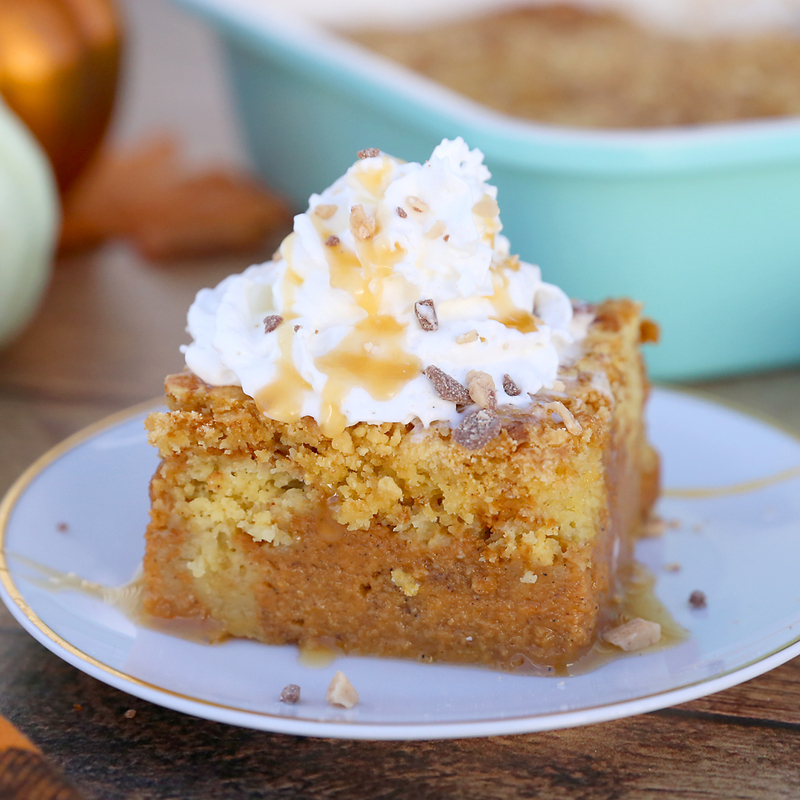 Pumpkin pie cake is my new favorite pumpkin dessert! Awesome post thank you for sharing !! it is really a good post..